Las Vegas Shooting Timeline Still 'Not Accurate,' Mandalay Bay Company Says At issue is whether the hotel was delayed in calling police after the shots were first reported by hotel security staff. The parent company of the Mandalay Bay hotel in Las Vegas, MGM Resorts, is providing new information that contradicts the latest police timeline of the mass shooting that took place Oct. 1. In a statement, the company says information from police indicating that a hotel security guard was shot six minutes before the shooting began is "not accurate." At issue is whether the hotel was delayed in calling police after the shots were first reported by hotel security staff. Las Vegas Sheriff Joseph Lombardo said Monday that a Mandalay Bay security guard, Jesus Campos, was shot at 9:59 p.m. The shooter began firing from his room — on the hotel's 32nd floor — into the crowd below at the Route 91 Harvest festival at 10:05 p.m. The statement from the hotel company says that time was based on a "report manually created after the fact without the benefit of information we now have." MGM says that the shooter actually began firing into the festival within 40 seconds of when Campos first reported over radio that shots had been fired. "Although we prefer not to comment on the details of the investigation, we are issuing this statement to correct some of the misinformation that has been reported. The 9:59 p.m. PDT time was derived from a Mandalay Bay report manually created after the fact without the benefit of information we now have. We are now confident that the time stated in this report is not accurate. We know that shots were being fired at the festival lot at the same time as, or within 40 seconds after, the time Jesus Campos first reported that shots were fired over the radio. Metro officers were together with armed Mandalay Bay security officers in the building when Campos first reported that shots were fired over the radio. These Metro officers and armed Mandalay Bay security officers immediately responded to the 32nd floor. We will continue to work with law enforcement as we have from the first moments of this tragedy as they work toward developing an accurate timeline." The statement comes as attorneys say they're talking with victims about possible lawsuits against the hotel company and other parties they say may be responsible. 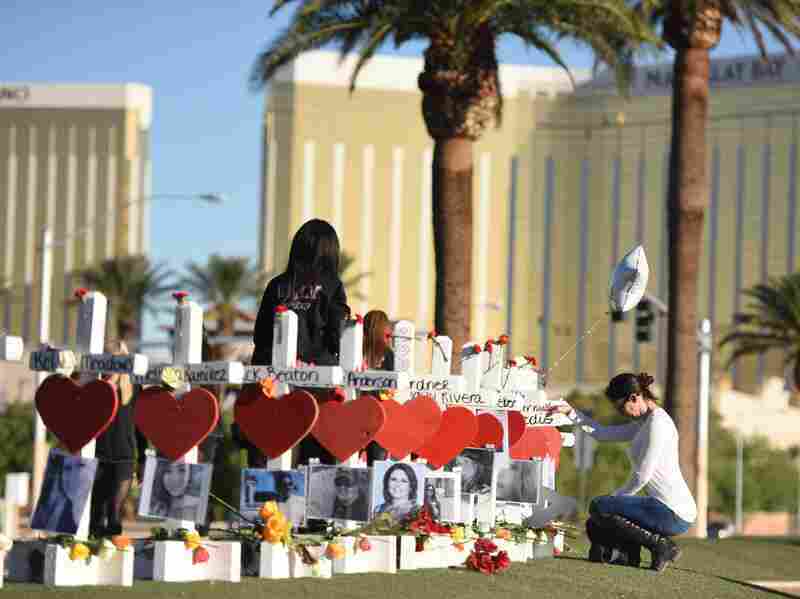 At least one victim has already filed a lawsuit in state court in Nevada seeking to freeze the assets of the shooter, Stephen Paddock, and preserve them for the benefit of the victims and their families. The most recent timeline released on Monday by investigators is a change from their initial timeline, which indicated that Campos had been shot after Paddock began shooting into the festival crowd. Campos was injured but released from the hospital last week. He's being hailed as a hero who helped shorten the length of time the shooter was able to fire on the crowd.